Click Leader Spools at left to enlarge. The weather had been mostly below freezing for over two-weeks, and the water was clear as gin. Also the fish traffic had picked up,and the fishing had fallen off. Last summer while fishing the Dean, I had adopted their leader system for Skagit style fishing, which consisted of four-feet of 20-pound test Maxima Ultra Green. It worked there and when I started my fall season it worked well here as well. In each case there was very light fishing pressure. But, as the fishing pressure picked up, my catch tapered off. Since the water was so clear, I decided it was a great oppertunity to shook some under water pictures of flies. It was while examining the pictures of the flies that the crux of my slow fishing was revealed, my leader looked huge and bright in the sun lit water. It was time for a change. A couple of days later the river was even lower, and still the same temperature, but my leader was four feet of Frog Hair FC Fluorocarbon in 12-pound test and the results were better. 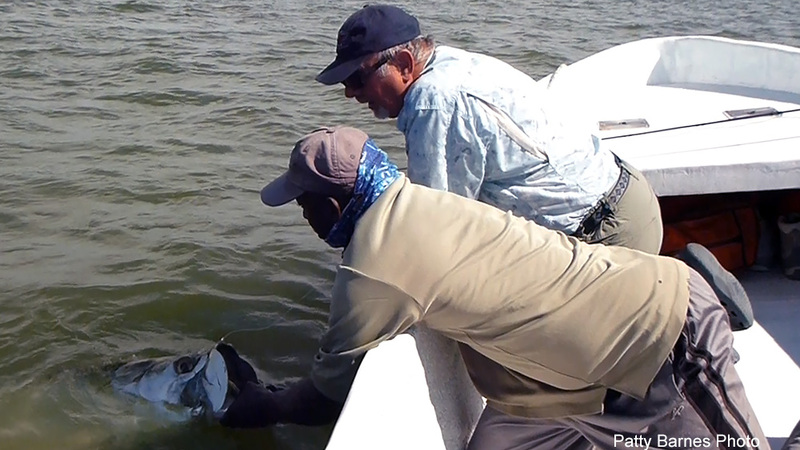 Under certain conditions monofilament is reflective and highly visible. 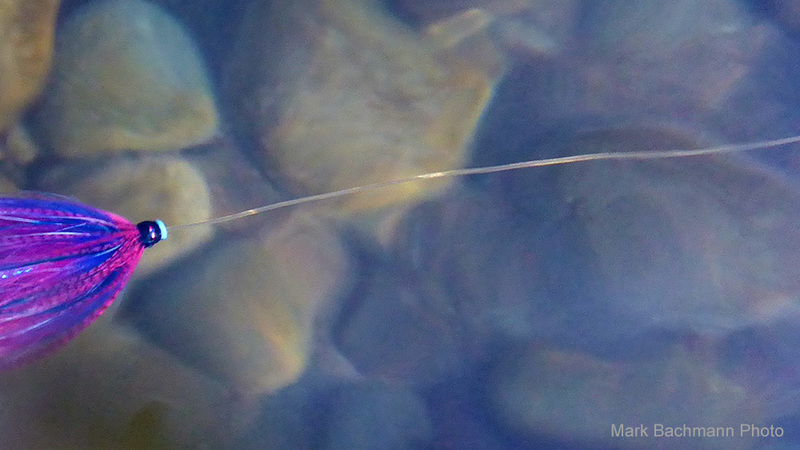 When submerged fluorocarbon reflects a spectrum of light that makes it nearly invisible to both humans and fish. When steelhead are fresh from the Ocean, or when the fishing pressure is low, they don't seem to recognize a leader as a threat. But they learn pretty quickly, and after being pricked a couple of times they seem to detect flaws in fly presentation, sloppy casting and things such as reflective leaders. There is only one problem with fluorocarbon: whereas Maxima costs $4.40 per tippet spool, FC Fluorocarbon costs $13.95, or roughly three times as much as the normal leader. Is it worth it? Look below. 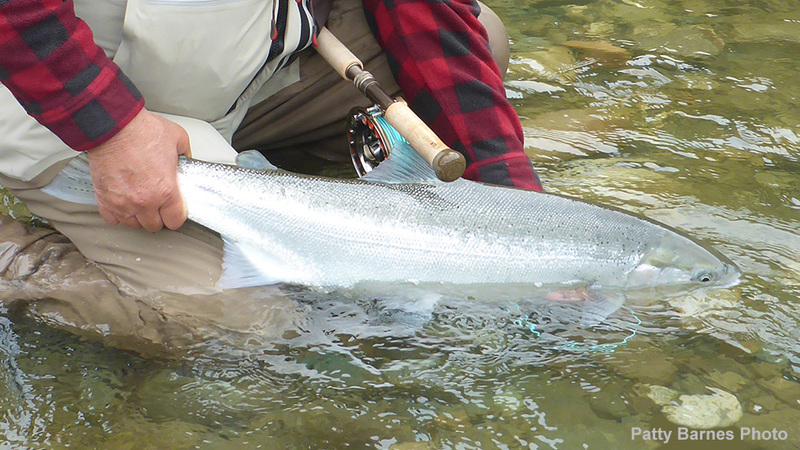 This local steelhead was landed with 12-pound test Frog Hair FC Fluorocarbon. The battle lasted about twelve minutes. I have used a lot of Frog Hair FC Fluorocarbon leader over the years, mostly during saltwater trips. I learned early on that if a bonefish sees your leader move it isn't very long until they are a long way a from it. All flats fish are leader-shy. Plus fluorocarbon has great knot strength and is very abrasion resistant. In the saltwater as well as the Spey arena fluorocarbon has another endearing quality, it is heavier than water, and disappears below the surface in a hurry. 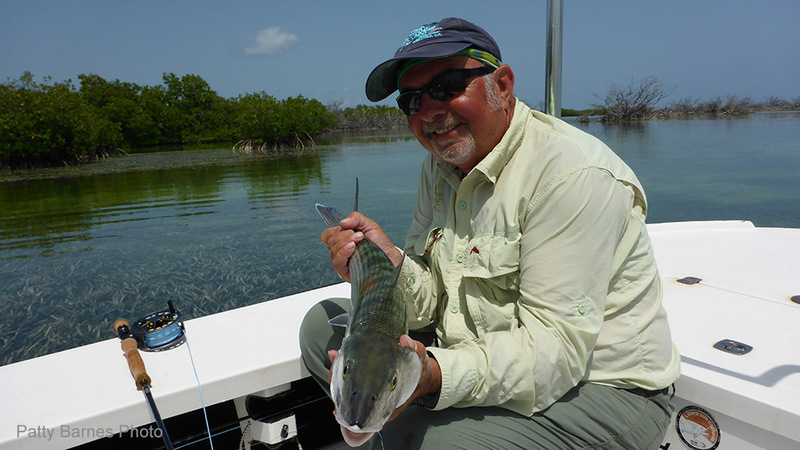 Mark Bachmann landed this respectable Cuban bonefish with 10-pound Frog Hair FC Fluorocarbon tippet. The battle lasted about ten minutes. Frog Hair FC is the latest advancement in fluorocarbon. Unlike other fluorocarbons, which behave `wiry` and stiff, Frog Hair FC is processed with GAMMA`s exclusive technology, resulting in the most supple and elastic fluorocarbon on the market. Now add in the superior refractive qualities of fluorocarbon and imagine the results! Frog Hair FC is truly your competitive new advantage in both fresh and salt water. Frog Hair FC is an ultra high molecular weight PVDF fluorocarbon made using GAMMA`s exclusive processing technology. Unlike other fluorocarbon monofilaments that are very rigid and stiff, Frog Hair FC is processed to increase the flexibility of the material and provide up to two times the suppleness of other typical fluorocarbon monofilaments. The added suppleness compliments the refractive qualities of fluorocarbon to deliver the most stealthy, natural presentation possible and increase your catch rate. This Belize Tarpon taped out at 103-pounds, landed and released with 20-pound Frog Hair FC Fluorocarbon, The battl lasted nearly an hour. 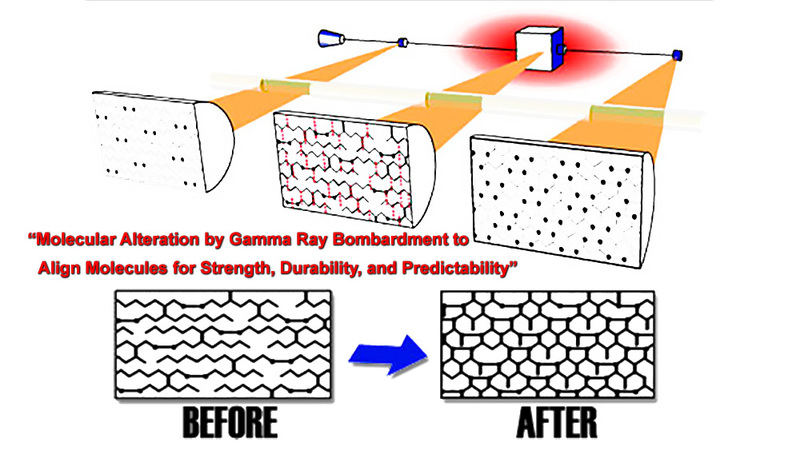 In addition, GAMMA`s process increases the Shock Resistance of the material to help prevent untimely break-offs resulting from aggressive strikes. The built-in Shock Resistance also provides greater fighting capability and enable you to land more and bigger, world class fish than you could with other leading fluorocarbon materials. 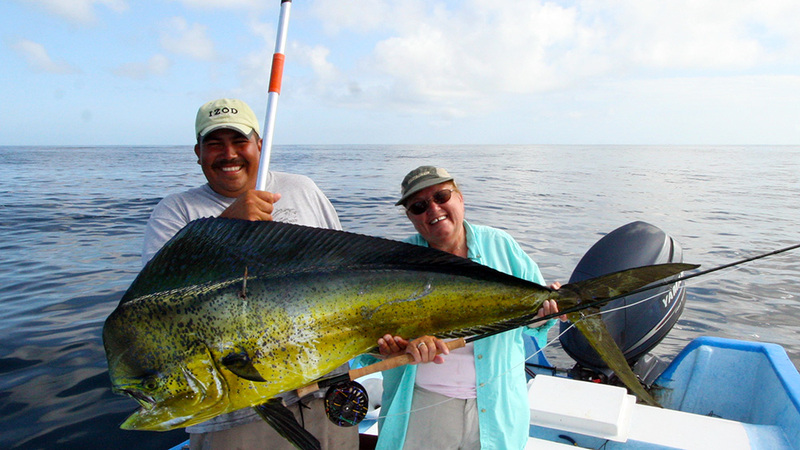 Patty Barnes with 45+ pound Dorado landed with 20-pound test Frog Hair FC Fluorocarbon after an hour battle. Gamma Technologies` ability to build a better product is accomplished by the willingness to differentiate, and their philosophy to engineer products from the ground up. This results in superior performance and added value for the user. I have used Frog Hair tippets in all sizes for a number of years, both mono and fluorocarbon. The rated strength isn't the highest you'll see in the charts, but if you pull test it, the stretchiness of frog hair makes a big difference! Try it--when you pull test it, especially with a hard shock, it feels much harder to break than other brands at the same diameter. Some people pass up fluorocarbon because of the cost, but consider this: it doesn't degrade with age. A 4-year-old spool of mono is weakened junk that should be thrown away, whereas FC retains its full strength until you use it up. The downside is that it doesn't degrade at all if you lose it in the river or on the riverbank, so try not to leave it behind!